I love it when people ask me questions that are perfect for sharing! One of my readers emailed me recently asking, “What are the best ways to market my book?” Well, I have certainly done my fair share of research, extensive reading on the subject, as well as online seminars etc., so I felt that I definitely had something to offer her on this subject. I promptly responded with all the advice I had collected in my pocket thus far and came up with this marketing checklist. Enjoy! 1. Print up a press/media kit to present along with a copy of your book. Take this kit and your book to small local book stores in your area and ask if they might consider shelving it at their location. If your book was published through a traditional printing house, then be sure to put their phone number and any other wholesale information in the press kit. This makes it more convenient for the book seller to order– and the easier it is, the more likely that they will do so. Now, if your book was self published you may have to go a different route in order to have your book shelved. Some book stores don’t like dealing with print-on-demand books because they can’t return them if they don’t sell, so you may have to buy a small stock of your own books and basically leave them with the seller on consignment. You can also take a copy of your press kit and book to the smaller news papers or magazines in your area. Often papers have a section for local authors and artists that they might consider featuring you in. 2. Volunteer at book stores to do book signings. This is good for exposure, sales and for just meeting the people who enjoy your work. 3. Post about your book everywhere! Updates on new releases, links to sale sites, quotes from the book, cover art etc. In this wonderful era of the internet you have so many marketing avenues at your fingertips! You can create a small photo sales blurb or article for your book and post it to sites such as Facebook, twitter, pinterest, WordPress, Tumblr, instagram, Google+ etc. The more locations that you make your book information available, the more people will see it and possibly take interest. 4. Build an author website. Most often your readers will want an informative preview of your work before they buy it. Your author webpage is a great platform for this. You can include cover photos, excerpts and the book jacket blurb, as well as info about yourself as the author; how you were inspired to write the book, your bio and bibliography etc. Look at other author pages for inspiration and as a guide. For webpage building I use godaddy.com, but wordpress also offers webpage building. I would advise you to look at a few author web pages for an idea on the best approach to organization of the site and the content, but here are a few things you should cover to get you started: name, bio, bibliography, links to buy your book, excerpts from your book, book reviews, schedule for signing events etc., contact info or at least a Facebook page link. 5. Offer signed copies online. I love doing this as a great way for getting to know my readers. You can buy copies of your book, have them in stock, signed and ready and accept payment through Paypal when orders come in. I don’t charge extra for signed copies, but some authors do. 6. Start a Facebook author page to build a more personal connection with your fans. This way your readers can actually talk to you, give you feedback, ask questions or just follow your progress on projects and other events. I love meeting new people, hearing their opinions and just getting to know what they see in my work. 7. Use a movie-making program to create a book trailer. Look up other book trailers on YouTube as a guide on what catches your attention and is appealing. You can also look up YouTube videos on how to make a book trailer. It’s pretty easy, but a little time consuming, so just set a day aside for this project. 8. Create contests to generate interest, to get your work out there and to get feedback on your work. You can create a contest on Facebook, on your webpage, here on WordPress, or on Goodreads.com . Give signed copies of your book to the winners and ask that they please post a book review on Amazon. Reviews help in the book selling process more than anything and it also helps you as the author to know what your readers want, what they do and don’t like in your current work. 9. Seek out book award contests in the genre of your book. You can enter, maybe win awards and then tack that award onto your book info and bio. Many award contests do cost money to enter but some are free. Writer’s digest does contests all through the year for many different genres, including short stories and self-published books. 10. Do a search on book fairs in your local area. Find out if and how you can enter. Get copies of your books and present them at the book fair. This is really a great one for getting your book out there AND for meeting new fans face to face. You could also set up shop in flea markets or lay a few copies of your books out while having a yard sale etc. Get creative! 11. Make sure your book is on wholesale listings. If you have been traditionally published then your book is most likely already available for wholesale, but if you are self-published this may not be the case. Check with your publishing house for the wholesale status of your book, if it isn’t already listed they can usually get it up and going for you. 12. Donate copies of your books to public libraries, second hand bookstores, homeless shelters, retirement homes etc. This isn’t a high end marketing strategy, but it gets your book out there and in the public eye. Maybe only one person stumbles across it in these shelves, but maybe that one person will pass it along to friends. 13. Business cards! I know this may sound silly, but it’s not. I can’t tell you how many times I’ve been out in a coffee shop or at a friend’s house, my books are mentioned and then someone says, “oh, I’d love to check those out!” Well, you can tell them your website address or write it down for them, but chances are they will forget the address or lose the paper. So, I’ve found that having business cards on hand is much better– and professional. You can order business cards for around $7 at vistaprint.com— I’ve used them for years and they’re great. Keep the cards simple, no need for too much unnecessary info. Save the lengthy info for your web page, the card will direct them there. The info on my personal business card is as follows: Davina Rush, Writer and illustrator, phone number, business email and web address. Having your own photo on the card is a good idea too. This gets people familiar with your face as the author and the “brand”. You may also want to include a QR code for your page, for quick scan and go access. You can do this by using a QR code generator. 14. Early promotion. Start promoting your book before it’s even finished. Once you have the cover art and a good bit of the writing done, you can start releasing posts with the book cover, back of the book blurb and maybe even a tantalizing excerpt from the book. 16. Do an online book tour! Sounds crazy, right? That’s what I thought the first time I heard of it, but really it’s a great idea and a lot of big name authors are doing this now. Basically you do guest appearances in FaceTime video blogs, podcasts or written interviews with bloggers. This can be a lot of fun and a great way for your readers to get to know you. Of course you can also do a traditional book tour, by setting up locations yourself, including them into existing travel plans or through an agent, but you definitely save time and money by doing the online tour. But hey, if you’re planning a vacation anyways, make it count! 17. Register as an author on Amazon and GoodReads. It’s really simple and helps you to improve your professional appearance in the cyber world. 18. Create merchandise for your book. You don’t want to go too overboard with this early in the game, but you could start simple with something like printed bookmarks, bumper stickers or buttons using your cover art and a favorite quote from the book. You can have these made at a local printing shop or use a print on demand service such as Cafepress. Do price comparisons on each of these and see what works best for you. 19. Add a link for your webpage and/or sale page in your email signature and on stationary. This is a great way to get people curious with the convenience of a little teaser and the link right in from of them. 20. Purchasing advertising is the obvious marketing strategy, but today it is even easier than ever. You can purchase advertising for a reasonable price on Google, Facebook and a number of other avenues. Your work will pop up in news feeds, YouTube videos, Google search etc., generating interest and traffic to your site. Really, the ways that you can market your book are endless! Just be creative. 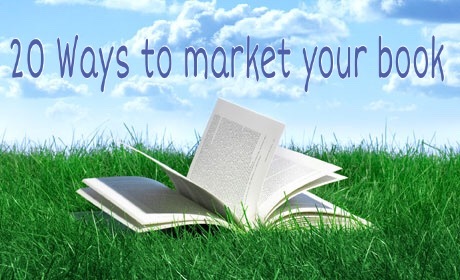 Whether it’s making merchandise to go with your book or renting a billboard, giving your book as Christmas presents or housing a book release party in your home or online via Facebook or Google+, marketing can really be a lot of fun-and it’s really important. Whether you are self-published OR traditionally published you should learn all that you can in this area and be active in selling your book. Publishing houses will list your books and get them into the stores for you, but generally they don’t do any advertising for your book, unless it’s a really huge seller. So, it’s up to you to get the word out there and get the ball rolling. It can be a lot of work, depending on how you approach it, but that’s all up to you– how much or how little marketing you do. Just be creative, confident and have fun with it! Previous Previous post: The brand is YOU!